AS ANYBODY who plays golf will tell you, it is a highly addictive game. So it should surprise nobody to learn that countless celebrities, many with plenty of spare time on their hands, play the game on a regular basis. Take a trip along to any of the European Tour’s Pro-Ams, staged on the eve of tournaments, and you will have the opportunity to see former footballers, cricketers, snooker players and boxers strutting their stuff. There is also a fair chance that you might catch the odd TV or film star, perhaps even a model, a DJ and, heaven forbid, some rock musicians. Here we take a look at just 18 of the celebs who love this game as much as we do. Cooper is an alcoholic who also developed a drug problem. Most people who suffer from those issues opt for therapy. Not Cooper. By his own admission, the rock star has an addictive personality and he decided that the best way to deal with his drink problem was to find a new addiction. So he took up golf. He reckons that he plays at least 300 times a year. And all that practice has paid off – at one time he got his handicap down to four. Murray was one of the stars of the golf movie Caddyshack, in which he played groundskeeper Carl Spackler. He is also a very keen golfer in real life, but, as anybody who has watched him in action at the AT&T Pebble Beach Pro-Am will testify, Murray seems to spend most of his time playing up to the camera. And, quite frankly, he is not very good, despite claiming to have a handicap of eight. The Real Madrid and Wales footballer has been bitten by the golf bug – and how! He has even had a golf hole built in his back garden. Not just any old golf hole, mind you. No, the footballer has had an exact replica of the world-famous island par three 17th at TPC Sawgrass constructed in his grounds. He plays off five. Well, if you’ve got it, you may as well flaunt it! The Canadian singer is a golf nut, so much so that she even has her own golf course. No, really. Her home has its own private course. She once jumped into a pond with Karrie Webb when the Australian won the Kraft Nabisco. It still isn’t clear what part Dion played in Webb’s triumph. Calvin Cordozar Broadus Jr, better known as Snoop Dogg, was once a member of a street gang, and he also served time in jail for cocaine possession. He may not seem like your typical club golfer, and he isn’t, but the hip-hop star loves the game and reputedly has an 18 handicap. He can certainly afford to play as he has sold tens of millions of records. “I got rhythm, I got music, I got my gal, Who could ask for anything more? I’ve got daisies in green pastures, I’ve got my man, Who could ask for anything more?” Yup, Anton Du Beke, as a star of Strictly Come Dancing, has plenty of rhythm but it may surprise you to learn that he is a fanatical golfer, with a six handicap. He says: "Golf is an incredibly sociable game and I really miss the regular rounds I used to enjoy with the late Sir Bruce Forsyth.However as much as I enjoy the camaraderie and banter of a good game, I do have a handicap and am pretty competitive so I definitely play to win." Horan made his name as a member of One Direction, once the world’s biggest boy band. They were discovered on The X Factor and went on to sell millions of records and attract the attention of teenage girls around the globe. While many of today’s pop stars turn to drink and drugs, One Direction were a clean-living group and Horan spent his spare time playing golf. He caddied for Rory McIlroy during the Par 3 contest at the 2017 Masters and has launched his own company Modest Golf Management. The TV and radio presenter was inspired to take up golf after watching Seve Ballesteros on TV. She once hit a 300-yard drive – she knows that it was 300 yards because she and the people she was playing with measured it as they knew nobody would believe her. And the best golfer she has ever played with? “Anton Du Beke. He is the most beautiful player with a golf club in his hand. And the golf swing is a little bit like dancing.” Her handicap is 18. The former Westlife singer would be the first to admit that he went off the rails at the height of his fame, enjoying a party lifestyle and becoming addicted to poker. He also had a troubled personal life, his marriage to former Atomic Kitten singer Kerry Katona ending in a messy divorce. Eventually, McFadden found golf and turned his addiction to the sport. He plays off 12 and is a regular on the pro-am circuit. Timberlake is one of the world’s biggest-selling singers, shifting albums in huge numbers and filling music venues all around the globe. He is also one of the music industry’s good guys, with a clean-living lifestyle and a penchant for raising money for good causes. He was introduced to golf as a young boy by his father and quickly showed that he had an aptitude for the game. He now plays off five and even has his own tournament on the PGA Tour, the Justin Timberlake Shriners Hospitals for Children Open, which raises millions of dollars to help sick children. How cool is that? When he is not shooting people on the silver screen, Jackson can usually be found on the fairways. He loves the game, so much so that he has a clause written into his film contracts that allows him time off to play the game. "They have to let me play at least twice a week," Jackson said. "Generally they either move me onto a golf course or I join a club so I can play there.” His handicap is six. When he is not working he plays every day, sometimes 27 holes a day. Broadcaster Chris Evans’ wife Natasha is a professional golfer, which gives him something of an advantage. He came late to the game and quickly became hooked, He has even presented a golf-themed TV series. His handicap is 10. But things have not always been straightforward for Evans and his golf. In 2011 he partnered Nick Dougherty in the Dunhill Links Championship at Carnoustie, Kingsbarns and St Andrews. The pair won with a 40-under-par total over 72 holes. Needless to say, it raised some eyebrows – and Evans was subsequently banned from returning to the event. Kenneth Gorelick is better known as Kenny G. As one of the world’s leading saxophonists, he has sold tens of millions of albums and has a huge following. He played golf as a young man but stopped to concentrate on his music career, picking up the clubs again when he was in his 40s. All those wasted years. He quickly discovered something he had always suspected, that he had a genuine and natural aptitude for the game. At one time he got down to scratch and has a round of 67 at Riviera to his credit. Wahlberg is one of the hottest properties in Hollywood, having starred in a host of top-grossing movies. He has spent much of his career keeping his body in shape for the roles that he plays. When you put together the time he spends in the gym with the time spent on set, it doesn’t leave many hours in the day for Wahlberg to pursue his golfing passion. But he always finds a way. In 2015 he was in Michigan filming the latest Transformers movie in glorious weather. He would get up at 3.30am and head to the gym for an hour or so and from there it was off to Knollwood Country Club, Plum Hollow or Detroit Golf Club where he would set off at the crack of dawn, sometimes when it was still dark. Now that is what you call dedication. Tough guy actor Quaid has starred in more than 50 movies in a much-storied career. At one time he was a one-handicap golfer and in 2005 was named the top golfer among the so-called “Hollywood set” by Golf Digest magazine. Not bad when you find out that he didn’t even start playing until 1990. He says: "I took some lessons and struggled. Then one day, I hit a drive that was so crisp and clean, with no vibration. There's no feeling like it. I was hooked. All the stresses of daily life fall away on the course ? and are replaced by different stresses: 'Why am I flipping the club?’ 'Why am I coming so far inside?' Golf is meaningless, but it means so much.” We can all relate to that. Family Fortunes frontman Kay is married to Strictly Come Dancing presenter Tess Daly. Golf is his second love. He presented the European Tour’s Golf Sixes event in 2017, and his website even has a dedicated golf section. It features professional tips, Kay having golf lessons, the courses he enjoys playing and even equipment reviews. He makes it clear that he is no expert but it is clear that he loves sharing his passion for the game. 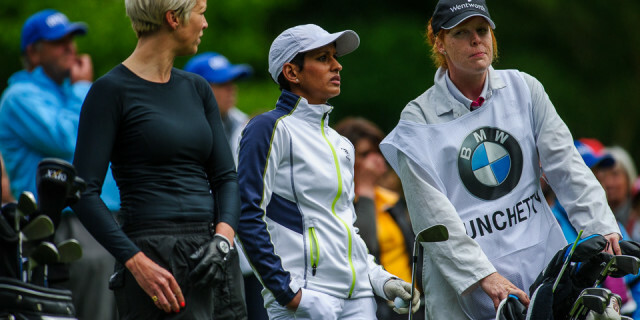 The BBC Breakfast presenter makes little secret of her love for the game of golf and she says that it has changed her life. “It’s helped with my temperament and my focus and, when you work the hours I work in a studio, being outside for four to five hours a day is good for you,” she says. "I used to think golf was an old man’s game, a posh game, and not for me. But I started taking lessons, and was taught by Anna Radford, who used to be on the Ladies European Tour, then I started playing. I just loved the fact you are competing against yourself.” She plays off nine. And, finally, we give you the country singer Vince Gill, arguably the best celebrity golfer of the lot, and a man who could well have made a living from the game had he chosen a different career path. He has been a scratch player since his high school days and regularly breaks par. However, he says that he made the right decision, claiming that his putting stroke isn’t and never has been good enough. In 2003, the PGA of America recognised his voluntary work in raising millions of dollars for junior golf in Tennessee by honouring him with its Distinguished Service Award.